If you think its hot here during the day, nighttime gets even hotter! Even though Orlando is known as the family theme park capital, there are many options for a night on the town. We have everything from sports bars, comedy clubs, and cozy pubs to high-energy dance clubs, entertaining dinner shows, and multi-venue mega-entertainment complexes. In downtown Orlando, you can check out the many clubs such as Tabu Night Club, Antigua, and Club Firestone, rated by Billboard as one of the top five venues in the world! And, all in 1 building, you’ll find Chillers on the first floor, Big Belly sports bar on the 2nd floor, and Latitudes rooftop bar, right on Church Street, with a great view of downtown. Many area resorts and hotels also boast top-notch bars of their own, which make for an ideal night, as proven by the glitzy Top of the Palace Lounge on the 27th floor of the Wyndham Palace Resort and Spa. 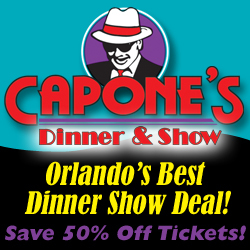 Visit our Dinner Show directory for a complete list of enjoyable venues where you can spend the evening being entertained while enjoying a wonderful meal, including Capone’s Dinner and Show and Pirate’s Dinner Adventure. Several area comedy clubs include Saks Comedy Lab and the famous Improv at Pointe Orlando. Multi-venue entertainment complexes are a great option for both locals and tourists alike. There is something for everyone at both Downtown Disney and Universal Orlando CityWalk. There are great restaurants, entertaining shows, movie theaters, plenty of shopping options, as well as many bars and nightclubs. And, the great thing is, it’s all in one place! Check out our NIGHTLIFE DIRECTORY for advice on which places to spend your evening out on the town.